Dubai. Shaikh Ali Abdullah Al Qasimi described winning the CSI 2* (Two Star) Dubai Grand Prix as ‘special’ after finishing on top of the leaderboard on the opening day of the Dubai Show Jumping Championship CSI5* W (World Cup Arab League) on Wednesday. A winner of the 2017 Dubai Grand Prix, Al Qasimi delivered a high-class performance aboard the 13-year-old Saga De La Rogue to upstage an impressive field of 41 riders from 15 countries. He picked up a winner’s cheque of Dh37,614.77. “It is always a good feeling to win and be on the podium,” said the 27-year-old, whose goal is to compete at the Olympic Games. “The Dubai Show (Jumping Championship) is very special to me personally, I have really good memories here in the arena, so I always have this winning feeling and winning spirit when I cross this gate here. 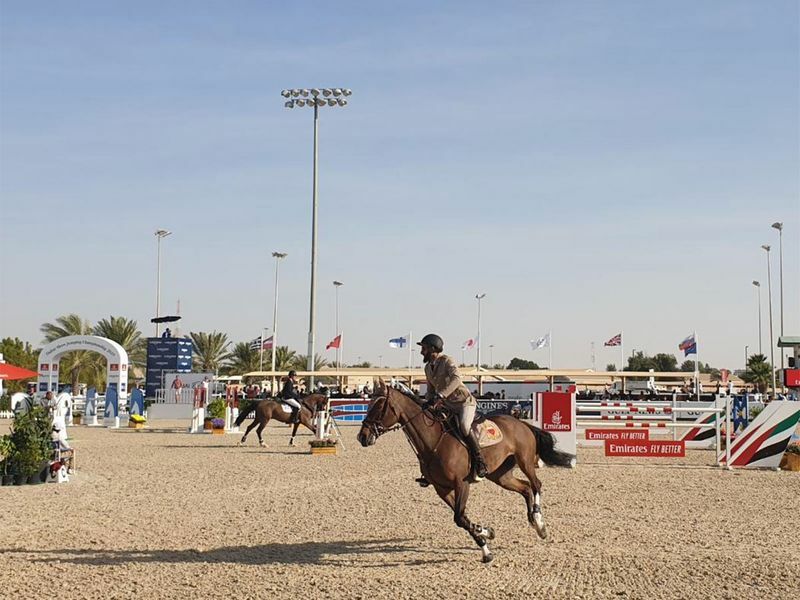 The opening day’s classes at the internationally acclaimed Dubai Show Jumping Championship, the topmost category of competition in show jumping worldwide, saw some strong competition all through the two sessions at the state-of-the-art Emirates Equestrian Centre (EEC) in Seih Al Salam. With the prize money pool worth Dh2 million, the four-day equine festival is expected to produce some high-quality performances leading to the final day’s Championship classes. The DSJC also promises fun-filled days of activity for the family and an excellent entertainment programme that has been arranged including a riveting dressage and flamenco performance, Z7’s thrilling horse show and much more. Apple Watches, iPhones and iPads, along with a meal for two at the Al Hadheerah restaurant are some of a range of attractive gifts to be won through daily raffle draw. The event is held under the supervision of the UAE Equestrian and Racing Federation (UAEERF). Since its 2018 edition when the show was elevated to CSI5* (five-star) status, the number of competitors has dramatically increased. More than 100 horses from 28 different countries around the world will be seen in action. The championship will be presided by Mohammed Essa Al Adhab, General Manager of the Dubai Equestrian Club and managed by Hamad Al Shamsi, Show Manager at the Emirates Equestrian Centre with the Ground Jury being led by Ground Jury President, Khalil Ebrahim. The CSI5* courses are designed by Robert John Ellis from Great Britain assisted by Emirati course-designer, Yousif Al Mahmoudi, for the CSI2* classes. ■ When: January 16 to 19. The Dubai Show Jumping Championship, a CSI5* (five-star) event, is the highest possible level global show jumping competition. It is tge sixth international show of the season and takes place over four days at the Emirates Equestrian Centre (EEC). 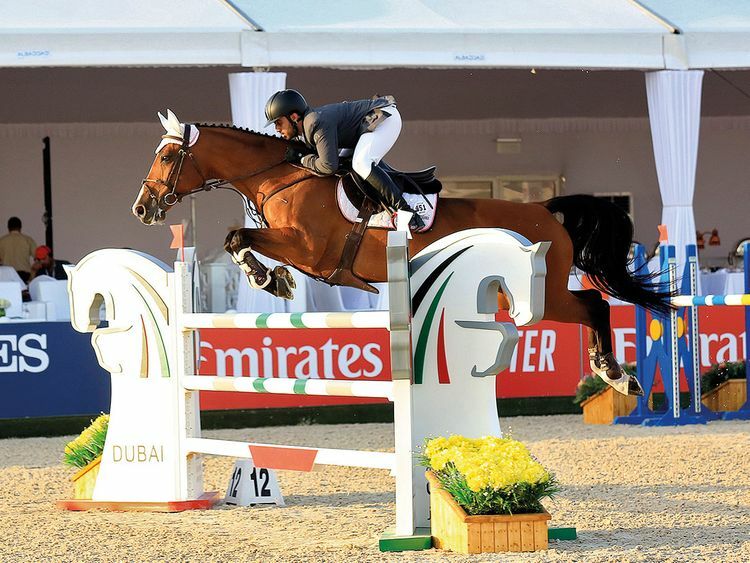 Riders from all over the world will compete for prizes worth AED 2 million - the stakes are high for this year’s competitors as they strive to clear jumps up to 160cm! The show will boast a total of 11 classes, including six CSI5* classes and five CSI2* classes. Over 400 entries from close to 25 countries will be seen in action. Show jumping tests the ability of horse and rider to jump over a series of obstacles inside a riding ring. Horses and riders must jump over a preset course of 10 to 16 fences that are up to 6ft 6in (2m)high or wide. Courses are designed with tricky turns and obstacles challenging both the mental and physical agility of horse and rider. The horse/rider must finish within a set time and penalties are given for knocking down rails and other faults. Scores are based on the number of jumps knocked down, falls, touches, refusals to jump and time penalties. The rider with the fewest penalties wins. The highest level of show jumping. Run under International Federation for Equestrian Sports (FEI) rules, the horse jumps a course of 10 to 16 obstacles, with heights up to 1.6 meters (5 feet 3 inches) and spreads of up to 2.0 metres (6 ft 7 in). A show jumper must have the scope and ability to jump large fences as well as the athletic ability to handle the sharp turns and also possess bursts of speed to navigate the difficult courses. Equestrianism made its Summer Olympics debut at the 1900 Olympic Games in Paris, France. It disappeared until 1912, but has appeared at every Olympic Games since.